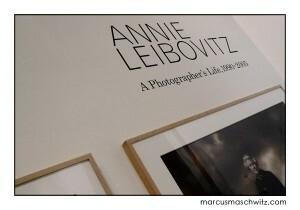 I spent a few hours today at the Annie Leibovitz exhibition at the National Portrait Gallery and it was really exciting and inspiring for me. I felt this even more than when I watch her documentary a few months back. The thing is that for some reason her work REALLY gets me thinking and I love her for that. The exhibition was really cool because it included some of her best and strongest works as well as some of her personal collection of images that she has taken of family and friends at home and on holiday and I love that they did it this way. Annie makes use of HUGE budgets when shooting commissioned works and then very little when just shooting on her own steam and I cannot say which I preferred. All I do know is that she makes me want to rethink about everything again and try to not just think of big scenes that we can create in a studio like environment, but to also remember to just document and capture what is really going on. Big budgets aren’t always necessary although we do know that they are fun. Haha. Anyway, I wasn’t obviously allowed to shoot in the exhibition so I tried to be sneaky and just get a shot for my collection so one day I will remember I made the show. This is that shot, it’s nothing great but it has a good memory for me. I hope you are all well and getting back into the working way of things. yay for some inspiration my love.